Wood picture frame Shadow box with miniature Violin [MIFR-004] - $69.95 : Metalcraft by Blair - military gifts and memoribilia. This is trully a great gift... it is done in 3D as a shadow box..If you were trying to say thank you to someone special who is associated with your symphony then this is the ultimate . 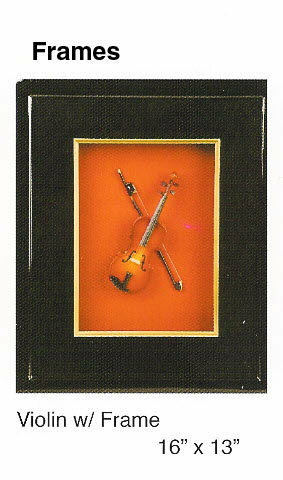 This is a high gloss black wood picture frame, that has a miniature musical instrument mounted .The frame measures 16" X 13"
These make a great gift to give, to that person who is into music or has made a significant accomplishment in the field of music..
A great presentation item for that person or company, that you are trying to recognize as a contributor to the music industry in your community. We have these available in several different colors and with different instruments.